Constantinou Bros Asimina Suites Hotel is perfect for couples, groups and adults wanting to enjoy a relaxing break in beautiful Cyprus. Set right on the beach, unwind on the golden sands or make the most of loungers, parasols, and pagodas, as well as the crystal clear waters of the sea. There are four restaurants to choose from, with everything from local Cypriot flavours created with fresh ingredients from the island to sushi and pan Asian dishes. 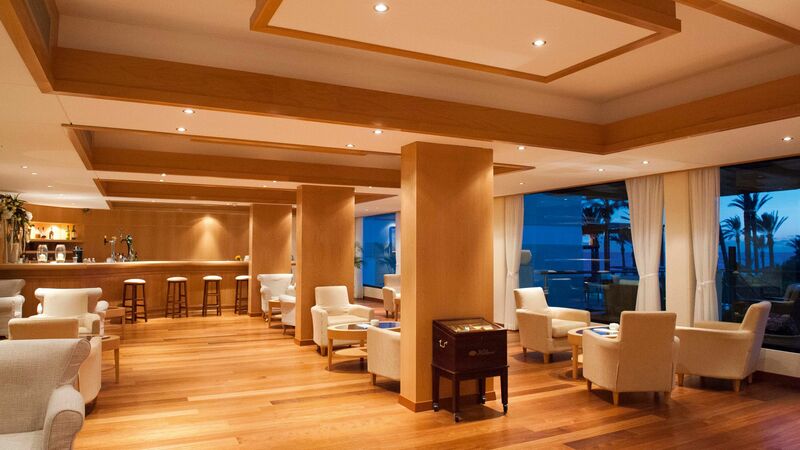 Choose from three bars and relax as you enjoy a range of wines, champagnes, beers, cocktails, and spirits. Upgrade to all-inclusive at the Constantinou Bros Asimina Suites Hotel and enjoy all drinks and meals included. 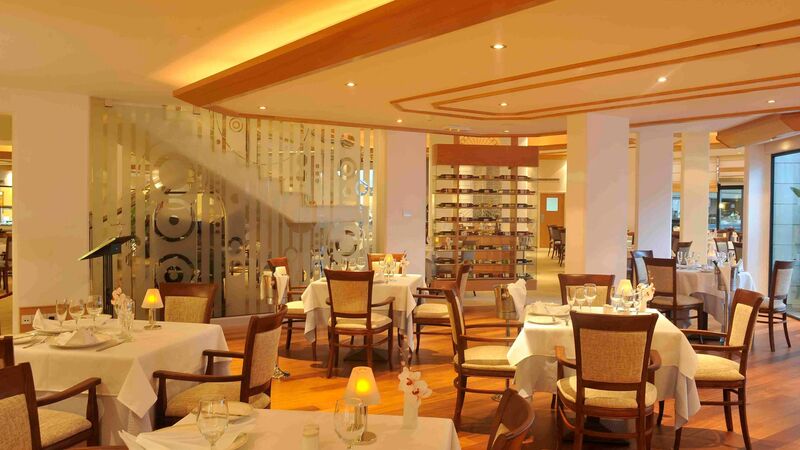 Choose from the 6 restaurants and bars and enjoy buffet and a la carte dining. The a la carte restaurant provides a glamorous setting where you can enjoy a range of dishes, with international and Cypriot options. There are both indoor and al fresco dining areas. 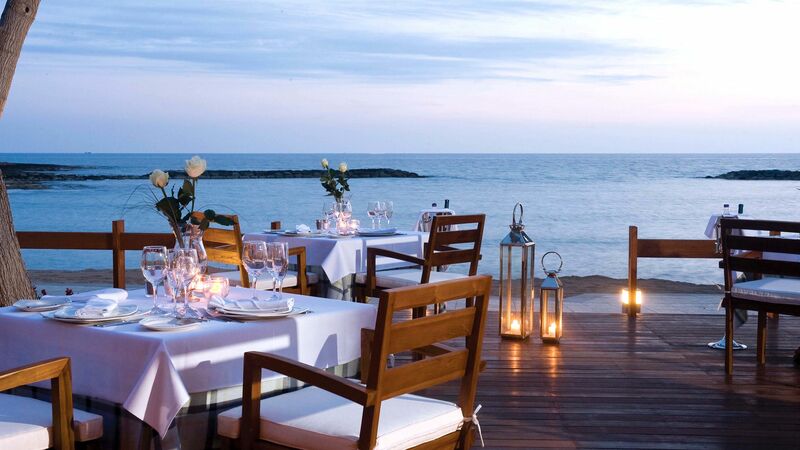 Meals at the a la carte restaurant are included for deluxe all inclusive guests. Located along the beach, enjoy beautiful views over the Mediterranean as you choose from light bites and fresh Mediterranean flavours. Meals at the Kymata restaurant are included for deluxe all inclusive guests. Choose from indoor or outdoor dining at the Estia restaurant where you can enjoy an English buffet breakfast. For dinner choose from Greek, Cypriot and international options. There are also a regular theme nights. Meals at the Estia restaurant are included for bed and breakfast, half board, full board and deluxe all inclusive guests. Enjoy late night entertainment, music and dancing as well as a range of drinks and snacks before and after dinner in this modern bar with large windows overlooking the gardens. A modern and cosy bar with large windows looking out onto the garden, the VIP’s bar is perfect for a relaxing drink. Choose from wines, champagnes, beers, cocktails and more. 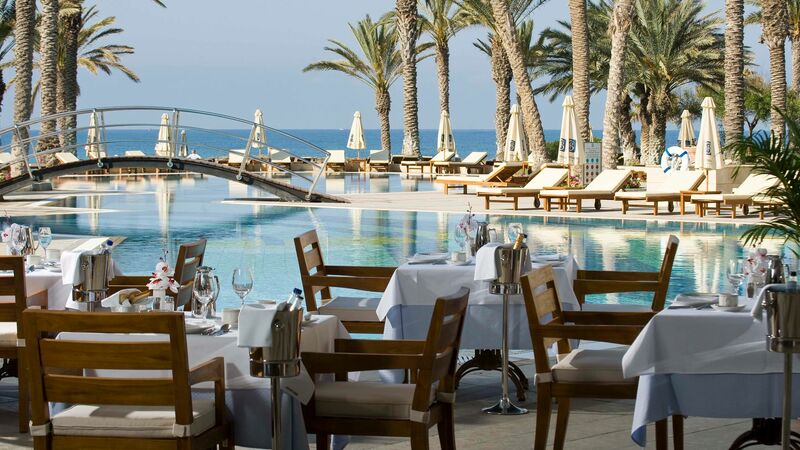 Overlook the swimming pool as you choose from light bites and meals on the pool restaurant’s al fresco terrace. Choose from two freshwater pools and a heated indoor pool. There are also loungers, parasols and towels available. 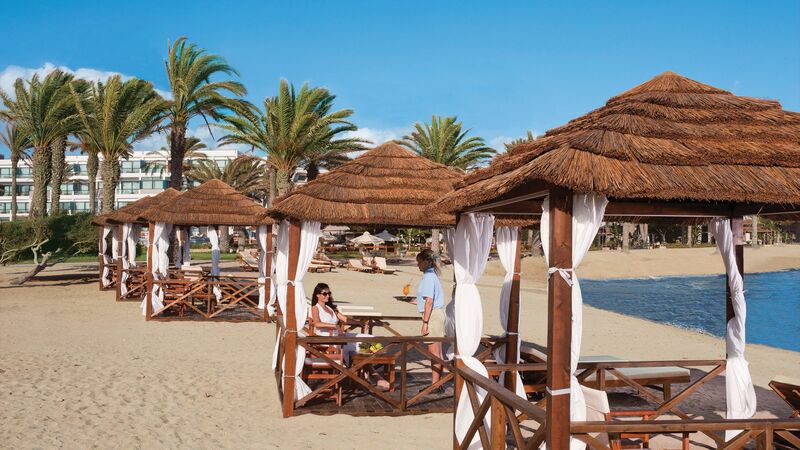 Relax on the golden sands of the beach or make the most of the loungers, pagodas and umbrellas. 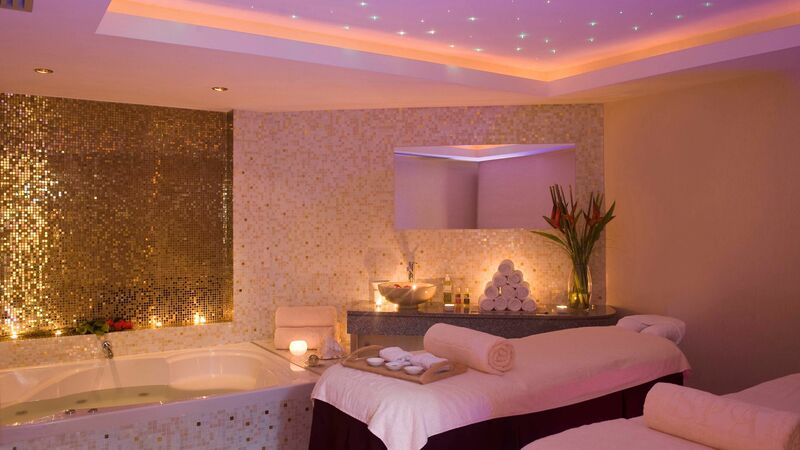 Choose from relaxing interiors or the open air massage area and enjoy a range of treatments with expert staff. There is also a sauna, steam bath and a relaxation room. Guests under the age of 16 are not permitted to use the spa. The air conditioned gym contains a range of cardio and strength equipment perfect for those wanting to keep active during their stay. Guests under 16 years are not permitted to use the gym. 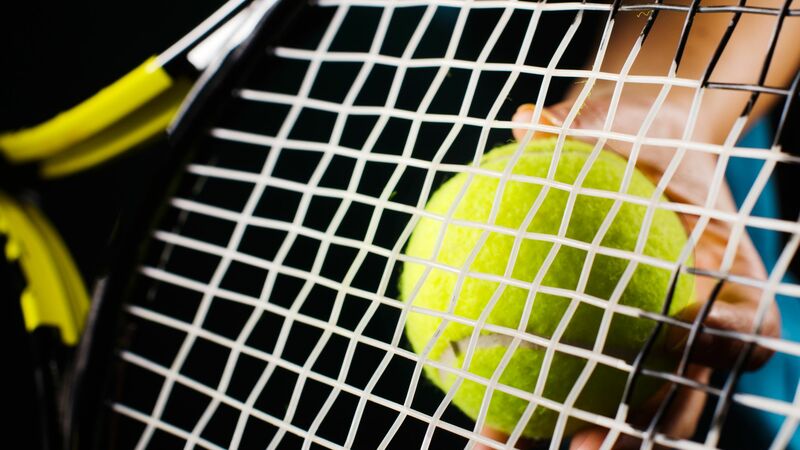 There are tennis courts and equipment available at the Constantinou Bros Asimina Suites Hotel. They are also floodlit in the evening. 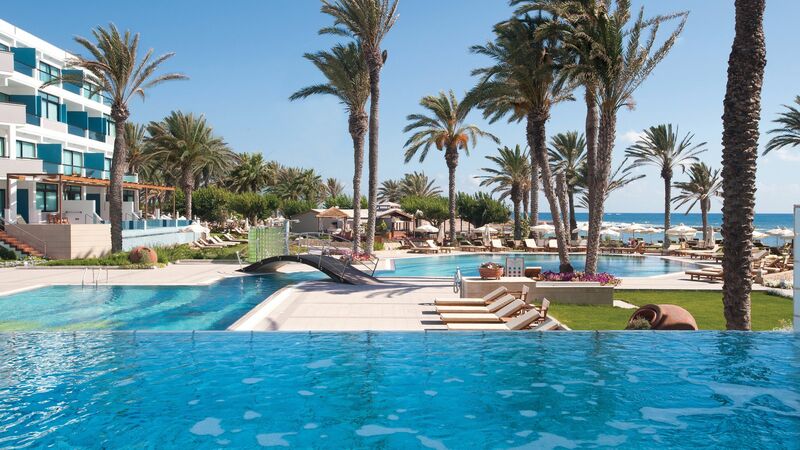 Located on the beachfront, the Constantinou Bros Asimina Suites Hotel is perfectly placed for those wanting to enjoy everything beautiful Paphos has to offer. Spend your day relaxing on the golden sands of the beach or find your own secluded cove. Alternatively, try some of the water sports available or book boat trips and excursions from Paphos’ modern marina area. History lovers will find many ancient monuments to explore, including Paphos Archaeological Park and the Tombs of Kings. Alternatively, discover the island’s more recent history and culture in the cobbled streets of Paphos’ old town. Here you’ll also find lots of little cafés, bars and restaurants serving up traditional Cypriot cuisine and fresh seafood dishes. 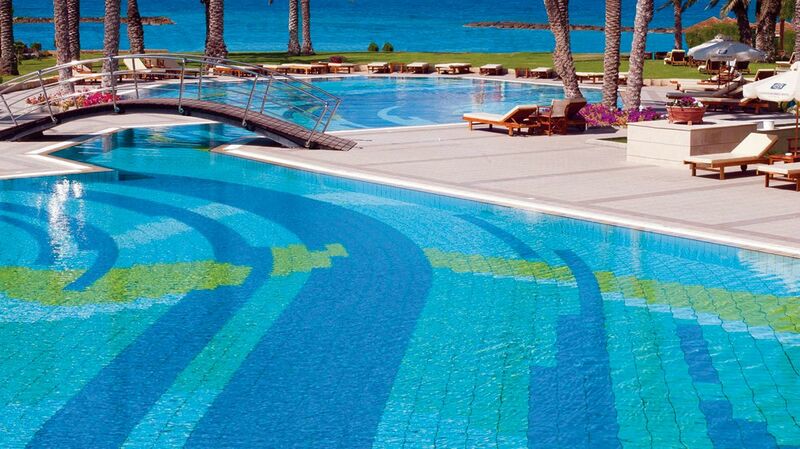 Constantinou Bros Asimina Suites Hotel is just a 15 minute drive from Paphos International Airport. Junior Suites are decorated and furnished to a high standard and offer a comfortable living area, a Simmons® luxury bed and a marble bathroom with a bathtub and separate rain shower. Please note that air-conditioning is available May-Oct. These suites benefit from luxe decor, a Simmons® luxury bed and have a distinct living area with a sofa bed. The marble bathroom features a bathtub, separate rain shower and a range of luxury toiletries. Please note that air-conditioning is available May-Oct. Please note the image used is of a One Bedroom Suite Sea View. 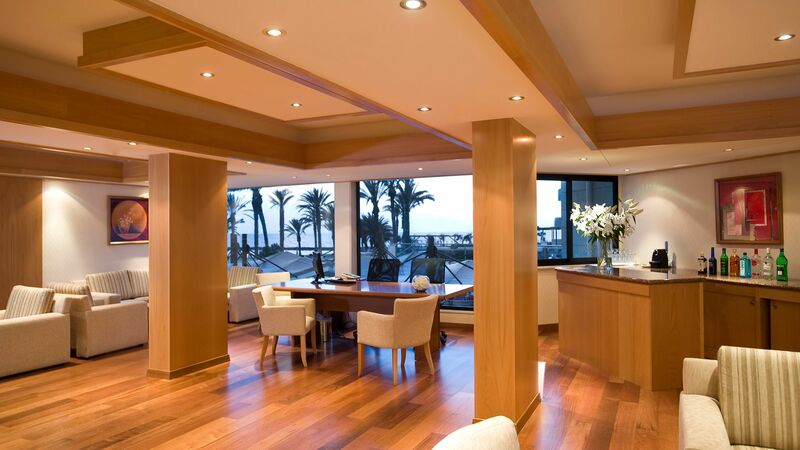 These suites offer a glimpse of the sea, along with luxurious furnishings and amenities. Each suite will have a Simmons® bed, separate living area with a sofa bed, and an elegant marble bathroom complete with bathtub, separate rain shower and deluxe toiletries. Please note that air-conditioning is available May-Oct. These one bedroom sea view suites are luxuriously decorated, have a Simmons® luxury bed and boast a separate living area with a sofa bed. The room also features a sumptuous marble bathroom, complete with rainfall shower and bathtub. Please note that air-conditioning is available May-Oct.
Superior One Bedroom Suites are stylish and comfortable and offer more space for guests to relax. The suite has a Simmons® luxury bed, separate living area and a marble bathroom with a bathtub and separate rain shower. Please note that air-conditioning is only May-Oct.
Executive One Bedroom Suites have their own private pool and a separate living area to the bedroom which has a Simmons® luxury bed and the marble bathroom has a separate whirlpool bathtub and rain shower. Please note that air-conditioning is available May-Oct. Enjoy beautiful views from this Executive One Bedroom Suite accommodation. Each suite has a private pool as well as a separate living area to relax in. The bedroom features a Simmons® luxury bed for a great night's sleep, plus these suites boast a marble bathroom complete with whirlpool bathtub and rainfall shower. Please note that air-conditioning is available May-Oct. Guests receive up to 35% discount on the ultra-all-inclusive supplement for holidays between 03 April -31 October 2019 booked by 30 April 2019. Book bed and breakfast and receive a free upgrade to half board for holidays between 03 April - 31 October 2019. Book half board and receive a free upgrade to full board for holidays between 03 April - 31 October 2019. Book full board and receive a free upgrade to ultra all inclusive for holidays between 03 April - 31 October 2019. Above special offers are valid for bookings until 30 April 2019. Book a One Bedroom Land View Suite and receive a free upgrade to a One Bedroom Limited Sea View Suite. Book a One Bedroom Limited Sea View and receive a free upgrade to a One Bedroom Suite Sea View. Book a One Bedroom Suite Sea View Sea View and receive a free upgrade to a Superior One Bedroom Suite Sea View. Above special offer is valid for holidays between for holidays between 03 April - 31 October 2019 booked by 30 April 2019. All Sovereign Guests will receive a bottle of Sparkling Wine in their room on arrival and late check out/ early check in subject to availability. Had a one bedroom suite with a seaview. Beautiful room, very well equipped and maintained. Hotel quiet, however, all facilities available. Food quality and presentation excellent. Staff very friendly. Only drawback - a bit of a walk into central Paphos. From the moment we entered, the service at Asimina was beyond perfect, from check-in to clean-up to the hotel's restaurants. Our stay was only marred by the cold weather - so be aware that the windy climate will prevent you from using the outdoor pools any time before May. We'll be certain to visit there again. Having briefly visited the Asimina Suites in June 2018 for a work function I was impressed and eagerly looking forward to my short weekend stay for my birthday at the end of March 2019. -My husband and I stayed in the one bedroom suite, which we found spacious, clean and comfortable. The bedding was exceptional and if we could we would sleep in it for hours. -The bathroom was also very functional, with his and hers sinks and the shower was fantastic and relaxing, especially as we were unable to book a massage treatment, due to it being fully booked. The pressure of the shower certainly made up for it! -Food was delicious and as clients we were very well looked after and tended to. -The staff at the hotel were kind and friendly. However, none more so than Andreas, one of the waiting staff. Andreas demonstrated absolute professionalism and attentiveness that certainly goes beyond his current role. He is a brilliant communicator, took time to converse with clients and make them feel relaxed. We noticed this quality not just in his rapport with us, but with the other guests at the hotel, which I am sure made them feel special. Andreas is a fantastic communicator, attentive and well suited for a job in management. I can certainly envision Andreas being brilliant in Customer Relations or Front of House Management. I hope that his seniors can see the potential in front of them, as our excellent experience at the hotel was also thanks to him. He is an asset to the team at Asimina and we hope he is given the right platform to flourish as he certainly deserves to. We look forward to returning to the Asimina and when we do, hope to see Andreas driving forward the objectives of the business in a well deserved senior position. Thank you. Wow, what a fantastic hotel. Staff are fabulous, go out of their way to ensure your comfort and enjoyment. They really work hard and are amazing examples to the hospitality business! The rooms are fantastic, the beds are soooooo comfy and being a suite hotel the rooms are very spacious. They are kept spotless by the maids who do an excellent job. Facilities for a perfect holiday are available here, the pool is fab and spa facilities also. You won't regret this one! !